Yesterday we had our first ever illumos hack-a-thon. About a dozen people from the community showed up, and worked on some very very cool things. At the end of the day, about a half-dozen different demos were done, to show what was worked on. Several other projects were in progress. Most importantly, people got to work on areas that they weren't intimately familiar with, and work with mentors who were much more familiar. For my own part, I had a blast working with George Wilson to implement the ability to alter the GUID of a pool (which is going to have some further uses we can talk about later). My webrev of these changes is now on-line, so I welcome review feedback. We had domain experts like Adam Leventhal, Matt Ahrens, Eric Schrock, George Wilson, Gordon Ross, and Dan McDonald on hand, to help mentor projects if they needed it, and the amount of cross fertilization was amazing. While none of the actual code changes are absolutely earth-shattering, they are still very very cool, useful things, that many of us will be happy to have available. I'm already imagining several useful use cases for the ability to reguid a pool, for example. And I can't wait until I have ::print in DTrace and tab completion in mdb. These will make my life significantly better. Ultimately, this was the most enjoyable coding experience I've had in a long time. I can't wait until we do it again! NexentaStor 3.0.5 is now available. Apart from fixing some key bugs, the main thing that this release includes is a significant update to the CIFS stack, which addresses both performance concerns, and AD failover concerns. Note that NS 3.1 is due out *any day now*, and will include all these changes, plus a boat load of others. I'll have a lot more to say about the 3.1 release soon. Joyent have continued to demonstrate their commitment to and support of illumos. In addition to a string of recent source code integrations, they are now hosting some of our infrastructure in their cloud, with more to follow. After moving the stuff there, we're now enjoying significantly better performance, and enhanced functionality. Try out the new OpenGrok instance yourself to see! I'd also like to give a special thank you to Circonus, who are providing active monitoring services for our site now, as a gratuity to illumos. Apparently, they're going to be hosting their stuff on illumos based systems as well, so there's additional synergy here. I'm looking for people interested in contributing content to the illumos website. Right now we have a test website but it needs help with producing content. First and foremost we need English content, but the new framework will support other localizations as well. If you're interested in contributing here, drop me an email. I'll be setting up a mailing list for this soon. A big thank you goes out to Areca. This will make another HBA option available to folks. (Note these cards do support a JBOD mode, so you don't have to use hardware RAID -- indeed I would recommend that you don't when you have ZFS on the disks. There is a common root language, that everyone speaks and understands. But speakers of it rarely agree on what to call it. In Serbia its Serbian. In Bosnia its Bosnian. And so on for Croatian and Montenegrin. I want to apologize to anyone offended by this decision, but rather than make a contentious decision on our own, I decided it was best to simply follow the decisions of an international standards body. I believe that there is no fundamental difference in the languages, although some national variances appear to be present in the data files. If someone has more accurate names for these, or believes that some aliased locales will assist with compatibility with other operating systems, then I would be happy to hear suggestions. Ideally from someone familiar with accepted practice in these locations. There is another wrinkle in all this too. This language -- thanks largely to occupation by Soviet forces as part of the SFR Yugoslavia, is commonly represented using two different alphabets -- Cyrillic and Latin. Generally most locations use Latin, but within Serbia, Cyrillic is mandated by law. So sr_RS uses Cyrillic, while the others use Latin. Anyway, if someone sees room for corrections or improvements here, especially if they are familiar with the language(s) and/or region(s), I would appreciate hearing back from you. It would appear that the old Planet OpenSolaris is no longer a community site. At least the only blog posts that seem to be there anymore are those that are hosted on blogs.sun.com. Certainly my posts, which used to show up there until quite recently, no longer do so. Its possible that this is just a technical snafu, but the recent burst of posts there from Oracle employees suggest a shuffling of things internally in how Oracle handles blogs, and I suspect that eradication of community posts is just one more step along the way. Great news! 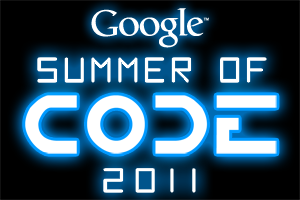 We (illumos) have been accepted as a Google Summer of Code mentoring organization. If you are a student and want to get paid this summer to work on an enterprise grade operating system, please have a gander at our ideas page, and then go ahead and start an application. You can find our application template on our organization information page on the GSoC 2011 site. The feature itself was developed by Sumit Gupta for Nexenta, and is part of our upcoming 3.1 release of NexentaStor. Subsequently, Dan took ownership of that code, and working with Eric and George (who are well established ZFS gurus and had significant and useful feedback) improved it still further, and got the code into illumos proper. I believe this represents the first significant ZFS feature to go into the tree since the illumos fork, and also amply demonstrates the collaboration in the illumos community. I'm looking forward to more collaboration like this in the community. Now, what does this feature give you? Well, if you're using SCSI Target Mode (either via iSCSI or Fibre Channel or FCoE) to serve up storage to systems running NTFS or ext4, you will be able to make better use of your storage. Traditionally, when a file was deleted from a filesystem, it was mostly a matter of book-keeping in the meta data in the filesystem. There was nothing to note this in the underlying storage. With newer SSDs, and with COMSTAR, the ability to get back this notification is incredibly useful. SSDs want it to do garbage collection or other optimizations thereby improving performance. COMSTAR wants it because now when your thinly-provisioned zvol gets the notification, we can return the storage back to the pool. Prior to this change, the zvol could only grow, it could never shrink. Now, we can give storage back to the pool when you delete a file on the initiator. This is huge in environments running with a lot of VMs using thinly provisioned storage with overallocation. Anyway, this is now in illumos thanks to Nexenta, and notably, Oracle doesn't have it. Of course, they are welcome to pick up the code for it, but they will need to follow the terms of the CDDL if they choose to do so, the same as everyone else. As promised, I'd send illumos photos from SCALE. Here's the illumos booth staff, from left to right there is Roland, Garrett (your humble author), Delya, Albert, and Rocky. 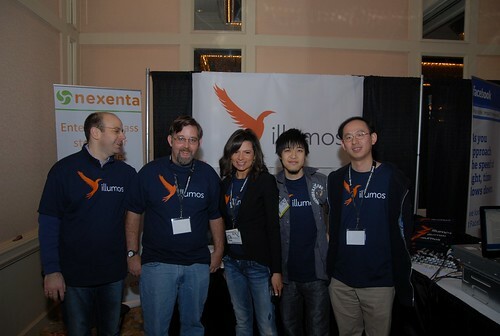 Rocky was there representing Area Data Systems, who are both Nexenta partners and illumos sponsors. We also have a facebook photo gallery up, which seems somehow apropos since we were right next to the facebook both at SCALE. I'm also pleased to report that a number of other Nexenta partners were present as well, showing off Nexenta based products. Next year, we hope they'll be back show casing technology based on illumos and NexentaStor 4.0.